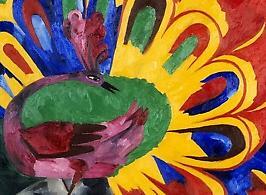 Natalia Goncharova (1881-1962) was internationally acclaimed figure of early 20th century art. Her life and work coincided with and gained influence from other important figures of Russian and French culture in that era such as Guillaume Apollinaire, Jean Cocteau, Pablo Picasso, Serge Lifar, Marina Tsvetaeva and Sergei Diaghilev. What however was unique in her method, was how she sought inspiration from a more primitive way of life; it was her way of turning to pagan folk cultures of the past to establish new movements for the future. Her outstanding talent lay in painting but she was also involved in such monumental art forms as theatre, book illustrations and stage and costume design. The Tretyakov Gallery exhibition presents a holistic approach to her art in all its forms, showcasing well over 400 paintings and works of graphic art and theatre decorations which have been acquired from the Tretyakov’s unique personal collection as well as other sources such as the Russian Museum, the Regional Museum of Russia, the Pompidou Centre (Paris), the Museum of Modern Art in Paris, the Fashion Gallery Museum, the Ludwig Museum (Cologne) and the Stedelijk Museum (Amsterdam).